I went to college in Pittsburgh. I lived in Tucson, Arizona before that. It was a strange decision to move there. But they had musical theatre as a major and I was accepted and they gave good scholarships. I thought the little city and cold weather would be good practice for New York. I didn’t know what I was doing, but I went alone to a place where I knew no one. The whole town was beyond different from the Southwest. I was lost. And confused. I was trying to understand so many new things. It was a hard time for me. Years later, I’m absolutely smitten with the city and it’s loving people. And the theatre there is magical, supportive and life-changing. It’s one of my most favorite places in the world. But in college, I had been used to the shorter history of the West and most buildings were newer where I came from. The Pittsburgh Playhouse was our theatre and is an anomaly, even to folks who grew up accustomed to the beauty of deep history. We performed, took class, rehearsed and worked inside the Playhouse, which was basically a pile of different buildings that were strewn together with secret hallways and staircases. The love for theatre joined together an old restaurant, a brothel, and a synagogue. I feel like when we’re little kids, the way that we imagine any place to be what is in our minds, the unlimited possibilities of that, I feel like that is how the Playhouse really is. Walking through it feels like how parts of dreams come together- like it doesn’t make sense but it did at the time and it doesn’t need to. Theatre seems to be a place where we can create like those little playing kids. And this building was a physical representation of putting things together to create something new. It felt like our giant treehouse rooted on the ground, made of cement, wood, love, and ghosts. People had said they had gone down to the old restaurant and seen the entire room filled with happy, partying ghosts. The costume room still scares the living bejesus out of me. I think a friend saw a woman’s face in the little square window in the door, even though no one was inside. These are stories I’d be so mad to read if someone else wrote them. Sorry if I’m scaring you. I’m scaring me too. Theatres always have ghost lights, a single lightbulb on a metal pole on wheels, that they put on the stage overnight. We were told stories about the ghost light and ghosts on the Rockwell stage, while we were standing on the Rockwell stage during our orientation. I was so scared that I blocked it out. And to this day, I don’t know if the ghost lights are there to ward off ghosts, or to help them see while we’re gone. I don’t want to know. Don’t tell me. Anyway, this old place would receive new coats of paint like a neglectful dad repeatedly buying his kids candy to make up for it. We couldn’t really change the structure or rebuild the inside, maybe for financial reasons, maybe for structural ones. But boy did we paint it. I got used to that. And now that they’re tearing it down to build a new theatre downtown in its place, I’m sad that we can’t just put another layer of paint. I know that it logically makes sense to give something new and sturdy to the students coming to learn. And the caretakers of this old beast are probably exhausted from holding its organs together. But it’s sad that we won’t be able to visit our memories in the same way. We won’t be able to see, touch and smell them. There will be pictures, and videos, programs, newspaper articles, costumes, set pieces, scripts, music, songs to sing and people… priceless friends and strangers with stories who remember. I think theatre can act as a diversion for what is hard for us in this world too. Other times it can act as a mentor, a question inspirer, or a glue that makes us realize we’re not alone. 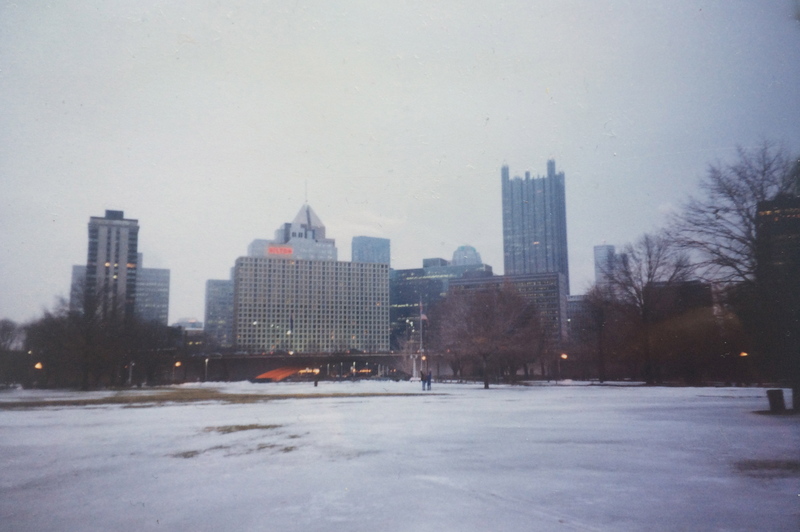 I felt alone when I arrived in Pittsburgh. It took a long time for the city and I to understand each other. This sweet place was part of all of that. I hope someone films the view of walking all the hallways. Places like this don’t get made anymore. I think they’re important. They encourage imagination because they are proof that things can be unique and work. And they seem to attract people who were the type of children that liked playing with the box of the gift more than the gift. Pittsburgh itself is filled with gift-box people though. So I think the new theatre will be in good hands. I just wanted to share that I’m sad. And share some of the wonderful uniqueness of this place. I hope the good hands that continue the tradition of the Playhouse also leave a map to the new theatre for the ghosts. But they’re so good at navigating secret passages, they might find it on their own anyway. Sending love to fellow Playhouse memoristas!